The Oakland Port Commission unanimously rejected three proposed maritime uses for the 50-acre Howard Terminal site near Jack London Square, one of which environmental groups vehemently opposed due to concerns over the proposed shipping of coal and petroleum coke through the port. 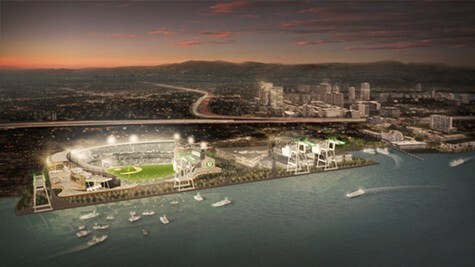 The decision may also one day lead to a 38,000-seat waterfront ballpark at the site for the Oakland Athletics. A group of local investors unveiled a plan last December for the ballpark, although A’s ownership repeatedly has claimed that the venue is not suitable for the team. The proposed ballpark at Howard Terminal. The stadium issue, however, was never directly mentioned during Thursday afternoon’s port meeting. Instead, members of the Sierra Club and other local environmental groups urged port commissioners to follow a staff recommendation to reject all three proposals for the port. Two weeks ago, commissioners acquiesced to a plea by one bidder, Bowie Resources, LLC, to allow it more time to provide documentation to the port’s staff. A representative from Bowie, which sought to export commodities such as coal, petroleum coke, borax, and iron ore through West Oakland, said it was evaluating the potential use of covered transport to carry coal through the East Bay. The extra two weeks, however, did little to reverse the previous recommendation. Margaret Gordon, a former port commissioner and long-time West Oakland neighborhood advocate, told her former colleagues to remember their social responsibility. “Keep doing what you’re doing and don’t allow cargo to come in here and have people adversely pay with their health just because there’s a port here,” she said. Colbruno, appointed to the port commission by Oakland Mayor Jean Quan, was the lone dissenting voice two weeks ago for postponing the vote on Howard Terminal. The port’s determination Thursday sets the early stages for the port to begin contemplating a ballpark at the property or some other types of use for Howard Terminal. The port’s ad hoc committee will meet next week, said Commissioner Alan Yee, to further discuss Howard Terminal’s long-term future. However, the meeting is not open to the public.